Eye Opticians proudly announces the launch of the TOM FORD Private Eyewear Collection, a special edition of sunglasses and optical frames designed for the eyewear connoisseur. 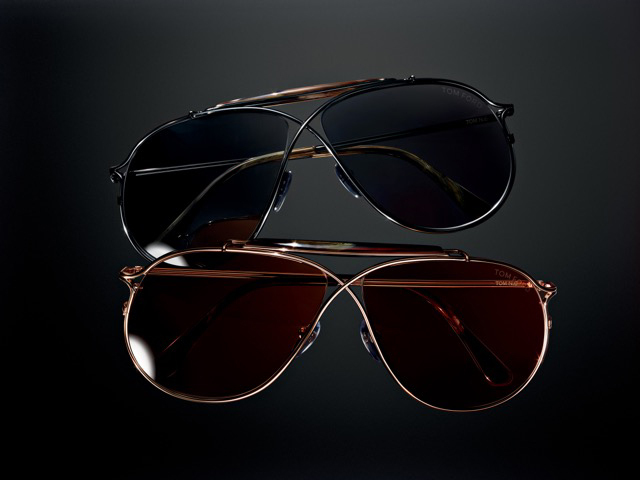 Handpicked by Tom Ford himself, the collection reflects the personal style of one of fashion’s most influential men. These are the frames that I personally wear and in some instances originally designed only for myself”, says Ford, “this is truly my own private collection. In most cases these editions of my favourite frames have been produced in new, elevated materials that are uncommon in most commercially produced frames. The eleven styles in the Private Collection commemorate Tom Ford’s eleven years of making exceptional eyewear and are crafted using ultra-premium materials. Real buffalo horn is selected for its warm and luxurious finish, with its unique natural pattern giving each piece an exclusive quality. The highest-grade Japanese titanium is chosen for its ultra-light weight and sleek, progressive look. All sunglasses feature high quality photochromic lenses that darken and lighten with the light conditions, ideal for use both inside and out. The five Private Collection Sunglass styles include the TOM No.2, a timeless style made from shiny black or shiny striped green horn and featuring the signature metal T at the temples. The new TOM No.8 is a generously rounded aviator shape with a thick bridge, offered in shiny black horn with light brown photochromic lenses. TOM No.10 follows similar lines but with a lighter and more spacious double-bar bridge. The curving, streamlined TOM No.4 and TOM No.6 reinvent the aviator from titanium in shiny rose gold, light ruthenium, and black. Their cross-front frames—a TOM FORD signature—and light brown or smoke with silver-mirror photochromic lenses create a head- turning look. The six Private Collection Optical frames echo several of the sunglass styles, but in slightly more subdued form. TOM No.1 is an aviator shape made of black horn with light smoke optical lenses. TOM No.3 is a double-bar wayfarer, offered in striped dark brown horn with blue lenses, or light brown horn with light brown lenses. TOM No.5 is a classic style that was made iconic by Colin Firth in the Tom Ford directed film “A Single Man.” For the Private Collection, it is offered in black horn with green lenses or striped brown horn with light brown lenses. A more rounded version of this silhouette, TOM No.7, is made of strikingly pale, light brown horn. The minimalist TOM No.11 is a horn version of the sleek and slightly geometric frame pictured in the previous TOM FORD Autumn/Winter 2015 Eyewear campaign. 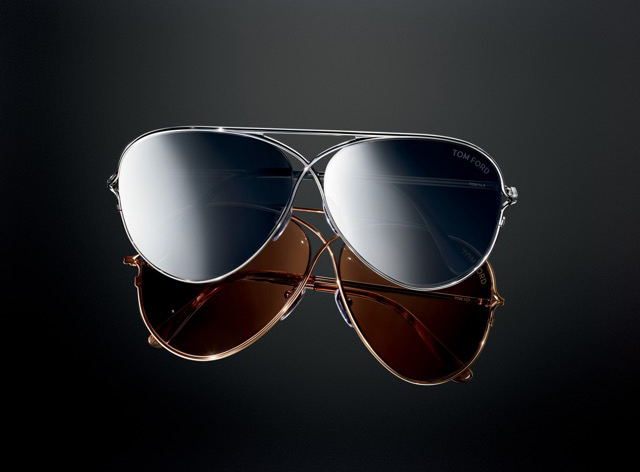 Metal detailing accents the bridge and temples and blue lenses enhance the striking look. The new TOM No.9 is a more subtle and ultra-wearable iteration of this style, made of striped dark brown horn with light green lenses.